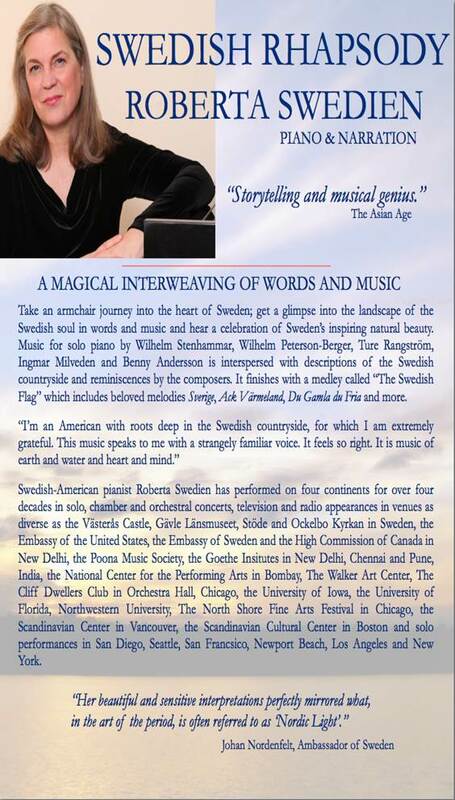 The Consulate of Sweden and the Swedish Church in Florida present an evening of Swedish Classical music with Swedish-American Roberta Swedien. Roberta Swedien has performed in four continents for over 40 years in solo, chamber and orchestral concerts and is now coming to Boca Raton. The piece Swedish Rhapsody is a tribute to the Swedish soul, expressed through words and music. The program includes Rangström’s Mälardrottningen, Jazz from Dalarna by Lindberg and a medley to the Swedish Flag which includes beloved melodies Sverige, Ack Värmeland, Du Gamla Du Fria and more. art exhibit by SWEA Art South Florida.